Miniature Daffodils are a fantastic addition to the front of the border, in clumps, or grown in pots. They are available for sale by mail order from most bulb nurseries. They are great for rock gardens and can also be easily grown in containers. In the garden they can fill a small position in a sunny border or can indeed be planted en masse to create a low carpet of flowers in spring. One of the most popular of all of the miniatures is Narcissus ‘Tete a Tete’, pictured right, it will get to around 15cm in height. Miniature daffodils have been bred to emphasis the special characteristics of the smaller growing species and they do include the species themselves, so take a look at these tiny treasures. For us the miniature daffodils appear early, even mid winter, so this makes then a wonderful addition to the garden when a little colour is needed. They seem to last longer than others and we have let them naturalise beneath a few deciduous trees as well as in the border. And of course they are excellent in pots as well. As for variety, the well known Tete a Tete with its classic nodding heads and Rip van winkle with its double flowers are both excellent. The Bulbocodium types including Bulbocodium conspicuus and the lovely white flowering ‘Nylon’ are others we like. Narcissus obesus and Narcissus cantabricus along with Narcissus cyclamineus hybrids are also worth a place in the garden. 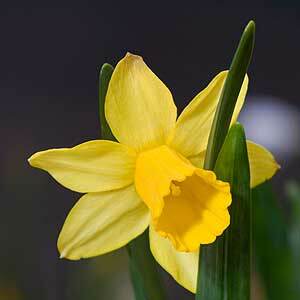 Miniature daffodils come in a range of varieties and can also look great in pots. Care of miniature daffodils is the same as for all daffodils. In fact its even easier, we leave the small bulbs in pots for 2-3 years before repotting. Once flowering has finished we put the pots in a cool shady spot until the next autumn. Some liquid fertilizer early in the season seems to do wonders.